"During the blood-soaked feudal wars of Japan, the Awa clan faced certain extinction from a rival clan backed by demonic forces. Their clan's salvation becomes a curse when the family dog brings back the head of the enemy warlord but insists upon marrying the lord's daughter! This unnatural union bears fruit, but they are killed; and their eight unborn pups reincarnate as the eight Dog Warriors - The Hakkenden. The eight reincarnated souls travel their separate paths of violence and retribution, but slowly they come together as a formidable group representing the eight virtues of the bushido to slay the demons and redeem their clan!" First things first: This series is based on a novel written by Bakin, in the 19th century. The story is impressive: The Satomi clan is almost faded to die of starvation, so they ask for help to the Anzai clan. Instead of helping, the possessed clan leader attacks the Satomi. So the Satomi flee for their survival. One night, Yoshizane, the Satomi leader, says to Yatsufusa, their dog, that if he brings back the head of their enemy he will give the dog his daughter&acute;s hand in marriage. So as promised, Yatsufusa brings the head of Kagetsura to the Satomi Clan. After forced to assume his obligation towards the dog, Yoshizane tells princess Fuse the truth. But Fuse was already engaged to Daisuke, one of the most loyal men to Satomi. Then Fuse accepts keeping her father&acute;s promisses, marrying Yatsufusa. Daisuke finds out about the secret marriage and rushes to get his revenge of the dog. By the hands of Destiny, Fuse gets pregnant of Yatsufusa, even though they never had any close encounter. Daisuke finds the dog and the princess and shoots Yatsufusa, but the shot hits Fuse as well. So, Fuse holding her buddhist rosary decides to open her belly out. By doing so she spreads eight beads and the souls of the cursed offspring. Those eight souls reincarnate as humans, and each single one of them has a bead with a virtue written in it. They are the Hakkenshi, the eight dog-warriors. The soundtrack is excelent: it got a bit old, because of the year that the series was created...but it is very japanese...the opening &quot;Aka-Fusha&quot; or &quot;Red Pinwheel&quot; is fantastic! The characters are very well explored, and each drama reveals itself a part of the cursed destiny of those eight souls. The art is very good at most of episodes, except for epis 4 and 10, that are hideous. The final episodes are amazingly beautiful, returning to the quality of the first ones. That happened because it wasn&acute;t made by one director only...several directors tried to do their sequel to the series...so some are perfect and others aren&acute;t so good. Overall, this is an excelent example of the way japanese classics are. Breathtaking, well told, this tale of the dog warriors is a must see! Let me start by saying that the first episode is by far the best. In fact, I would have given this a much higher rating if the show consisted of just the first episode. It is a truly great episode filled with epic battle, desperation, and crazy folklore. Unfortunately, the show takes a real dive afterwards and as it goes on it seems more and more like the writer and staff lost interest and even forgot what they had originally planned. Sure, there's some more awesome fight scenes, but most of the show is characters that haven't been properly introduced with either unexplained or so uninteresting motivations that you've forgotten what they were, aimlessly walking around and eventually bumping into people with whom they get in fights who are guess what? also Hakkenden! No way! You mean you've got a glowing birth mark too? but we were just fighting. Oh well, no point in explaining or even differentiating between the characters, hopefully this show will end soon. Or at least that's how I imagined the creators were thinking. Still, it's not without merit, some episodes are directed by different people and the art style changes too, which is cool because sometimes it looks really good. Also, as I mentioned, there is some good action and some truly sadistic happenings. This could have been a great show as I had been anticipating but I ended up having to struggle through to the end. They really kept meeting allies up until the last episode, it's like they didn't even plan it out. Very confusing. Still, if you're starved for Chambara as I am I guess it's worth a shot. If you can find it. Note that my review of Hakkenden covers my thoughts of the entire series. With that said, on with the review. This is quite the underrated gem as I haven't seen many reviews of it mentioned online. Before I cover the highlights to Hakkenden, I might as well cover the obvious issue with the series in the form of its animation. The series is notable for having gone through various animation teams throughout its run and it shows with the differing animation quality and styles that get employed in the title's different scenes. In the better animated parts of the series, characters looks quite lifelike and well detailed in their designs as they exactly as they would in 15th century Japan, which sticks out from conventionally drawn titles of the early to mid 1990s. At its worst, the characters look quite deformed and cartoon-ish in their designs as they move about and are more simpler in detail. Animated scenes are also a mixed bag here as you get occasions where you see nicely animated and brutal battle scenes or nice imagery coming from the various demons that the eight warriors encounter and instances where either you get enough still shots or choppy-looking movement coming from the title's varying animation styles that were being employed. I'm not too harsh with judging an anime purely on its animation, but there's no denying the inconsistency of it throughout Hakkenden may be a big turnoff for folks and is still a glaring issue with the series. If you can look past the visuals though, you'll find a rather engaging title mixing traditional samurai story with elements of Japanese supernatural folklore. The series is a tale depicting the eight reincarnated offspring of a demonic-possessed dog and princess Fuse of the weakened Satomi clan who slowly reunite to come together to restore their old clan to power. In terms of plot, Hakkenden is mostly focused on the slow reunification of the eight Dog Warriors as they learn more of their origins and have frequent encounters with demons and corrupt feudal lords, events that are usually instigated by the main antagonist of the series in the form of the demon Aboshi, with the first episode covering how the union between Fuse and the dog came about. The final episodes then focus on the eight reuniting with the Satomi clan to reclaim control over the land and having their final confrontation with Aboshi. While the plot seems simple in setup, the title's focus on its characters and time period add quite a bit of depth to Hakkenden. Many of the major characters in the series are fleshed out and you come to learn that the eight dog warriors share a connection through having tragic and violent pasts attributed to their unique upbringing and the time period in which they are brought up. This offers up a fresh approach to a historical title like Hakkenden where rather than the series glorify and romanticize the Sengoku era, the series focuses on the cruel reality of the era with political instability and violent warfare about. You have feudal lords caring more for their selfish needs than the well-being of others, families willing to give away their children to political figures for arranged marriage to either gain money or status, corrupt feudal lords willing to kill off anyone to save face for situations that cause the slightest of imperfections for their image and absolute loyalty/ devotion to feudal lords having its moral downfalls. To my knowledge, this was one of the first anime titles that offered such a focus for its historical setting and Hakkenden explores the problems of the early Sengoku era very well. Another notable element to Hakkenden is its music. Consisting mostly of light and traditional musical pieces, the various musical tracks are pleasant on the ears, flow nicely with the title's major scenes and offers one of the more beautiful sounding OP tracks I've heard in an anime. Hakkenden's historical focus, violence (plenty of dismemberment, blood and onscreen deaths are present here) and inconsistent animation make this a series that won't be for everyone. But if you have interest in historical anime and can look past the mentioned issues with the series, Hakkenden is an engaging experience with its rich cast of characters, supernatural elements and believable approach to exploring the early decades of Japan's Sengoku era. I pulled out all of my old anime dvds and this is one of the series that I needed to re-watch. This review covers the first 6 episodes since that is how this site has them separated. If you have the complete series like I do then this will cover the first dvd/volume and the first episode on the second dvd/volume. It is based on "Nanso Satomi Hakkenden" which is the longest novel in classic Japanese literature. 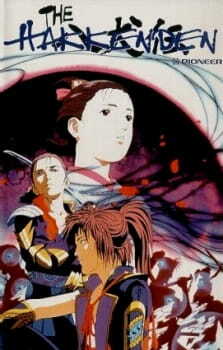 This OVA series was released in 1990-1992. As always I write these reviews assuming you have read the synopsis. The first 6 episodes cover 4 of 8 heroes re-uniting. It starts with the background story and then moves into their respective reincarnated lives. It takes you through the journey often times with dream like sequences so that the lines between reality and illusion are a bit blurred. The animation style and music were not of the highest quality even at the time of release, but it is still done in quite a beautiful way even given the mediocre quality. The flow and progression of the story is thought provoking. This is by no means a "dumb" series in the sense that you do have to pay attention to the flow of the story or it may just go over your head. It deals with dark themes and social issues that do not exist today. We are talking about the 1400's in this series. The characters are very human in their behavior, and they are driven by a common mystery that links them together. The spirit bead that each carries seems to draw them together, and they band together during each others darkest moments. The villain of the series leads them through a nightmarish psychological journey, and they will need the strength of all eight to complete their quest. If you're ok with older animation styles, and you enjoy psychologically driven stories then this is a must see. Remember this is the beginning of the series. There are 7 episodes to follow these first 6. The story is really just getting started at the end of these first episodes, and the characters have a ways to go in their development. Definitely worth watching.